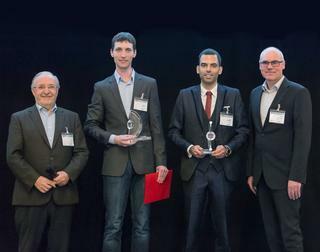 SEMIKRON Foundation and ECPE honour Mr. Stefan Matlok with the Innovation Award 2018 and Mr. Diogo Varajão for his work with the Young Engineer Award. The jury has decided to give the SEMIKRON Innovation Award 2018 to Stefan Matlok from Fraunhofer IISB in Erlangen, Germany for his outstanding work on ‘Zero Overvoltage Switching "ZOS"’. In power electronics turning off an electrical path is causing trouble by parasitic inductance leading to oscillations and voltage overshoot. The novel Zero Overvoltage Switching (ZOS) method offers the possibility to unleash unlimited switching speed in real-world applications without overvoltage on the semiconductors. Moreover, in best case, it is even avoiding any subsequent parasitic oscillation. The idea is to use the intrinsic parasitic inductances and parasitic capacities to build up a resonant circuit. The turn off event excites the resonant circuit and the free-wheeling diode stops it automatically after half a period, e.g. after a view nanoseconds. These resonant parasitic elements are thereby utilized to switch off a fixed current in a nearly lossless, overvoltage- and EMI compliant way. By designing the circuit and parasitics properly, there is no extra component necessary as parasitic inductance is now functional part of the topology. from AddVolt AS in Porto, Portugal for his contributions on ‘ACDC CUBE: Single-stage Bidirectional and Isolated AC-DC Matrix Converter for Battery Energy Storage Systems’. The ACDC CUBE technology consists in a new modulation and control strategy for the high-frequency link matrix converter. The matrix converter is a key element of the system, since it performs a direct AC to AC conversion between the grid and the power transformer, dispensing the traditional DC-link capacitors. Hence, the circuit volume and weight are reduced and a longer service life is expected when compared with the existing technical solutions. The innovation was validated through a prototype tested in the laboratory. Experimental results demonstrate the capability to control the grid currents in the synchronous reference frame in order to provide services for the grid operator. Additionally, the battery current is well regulated with small ripple which makes this converter appropriate for battery charging of EVs and energy storage applications. The SEMIKRON Foundation was founded on December 4, 2010, by owners of the SEMIKRON Group. Equal founders are the daughters of Peter Martin, the SEMIKRON owner and managing director of many years, who passed away in 2008. With the founding act, the founders intended to live up to their responsibility being the owners of a family-owned medium industry business and to contribute to their company’s “Corporate Social Responsibility”. The purpose of the SEMIKRON Foundation is to bundle and extend the charitable activities operated by the owners of the SEMIKRON Group. In particular, the humanitarian projects initiated by Mr. Peter Martin, and supported by the Mali Martin Care e.V. charity are to be continued. These projects support children and people in need all over the world. Over the past 10 years, Mali Martin Care e.V. has donated more than one million Euro to humanitarian projects for children and young adults, mostly in Brazil (projects “Centro Social” and “Lar do Menor”). In addition, the foundation supports research projects and innovations in the field of power electronics. For more information, please visit: www.semikron-stiftung.com.